Is Andis Black Master Really Worth It? Andis Pro Alloy vs Andis Master: Which should you buy? Oster Fast Feed vs Speedline: Is Design The Only Difference? Foil shavers: Andis Profoil or Wahl 5 Star Shaver Shaper? To say that the Oster Fast Feed clipper is great for its price would be an understatement. Its powerful pivot motor, sharp blades and cool operation are a winning combination. We’ve elaborated on this in our Oster Fast Feed review. Here’s the catch, though: Fast Feed guards can be a pain. And, you might want to experiment with putting a ceramic blade on it as an upgrade. 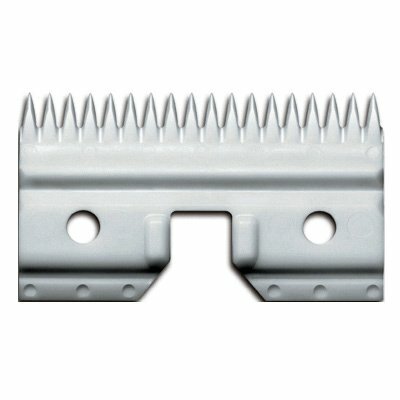 You receive 1/4″, 3/8″ and 1/2″ Fast Feed combs for free. You also fetch the blending comb if you want to do some fades. For most people, though, this isn’t enough. Another problem is the fact that stock Oster Fast Feed guards simply feel flimsy. Harsh, but true. They just don’t live up to the quality of the clipper itself. So what can you do? Oster have a set of clipper combs fully compatible with the Fast Feed clippers. These guards are made of hard plastic, same as the stock ones. The package includes Oster combs #0 to #8, with the exception of #5 which is not included. Speaking in inches, you get Oster Fast clipper guards sizes 1/16″ to 1″ (1/16″, 1/8″, 1/4″, 3/16″, 1/2″, 7/8″ and 1″.) The Oster clipper guards set is rather cheap on Amazon and will provide you with more customizability. However, there’s a better option. But will these Andis Magnetic guards fit Oster Fast Feed? Absolutely. You just need to make sure you get the double purple magnetic guards. If you read through some of the Amazon reviews, you’ll see many Fast Feed owners praising them. Makes sense. As I mentioned, usual Oster Fast Feed guards are simply flimsy. The plastic bends and is a bit of a nuisance to work with. Andis purple combs don’t bend and hold onto the Fast Feed blades with a solid grip. You’ll get easier, more precise cuts. You have two options here. You either get the smaller purple combs, or the bigger sized ones. The smaller Andis magnetic guards include sizes 0 to 4. You get a total of 5 combs, measuring 1/16″, 1/8″, 1/4″, 3/8″ and 1/2″. For our European readers – that’s 1.5mm, 3mm, 6mm, 10mm and 13mm. The bigger Andis purple guards come in sizes 5 to 8. You fetch 4 Andis magnetic combs, measuring 5/8″, 3/4″, 7/8″ and 1″. Again, for European clippers lovers – that’s 16mm, 19mm, 22mm and 25.5mm. Are they a bit more expensive than the plastic Oster Fast clipper guards? Yes, they absolutely are. Is it worth it to spend a few more bucks on them anyway? Totally. With Andis Magnetic guards fitting perfectly, this is the recommended route for supplementing them. Unreliable, subpar guards are one of this model’s few drawbacks. You’re effectively improving its potential as a professional clipper by choosing the right option. Sometimes you just want to get a little bit fancier with Fast Feed blades too. And, without any doubt, the best option here would be the Oster Fast Feed ceramic blade upgrade. Well, ceramic blades usually stay way cooler than standard stainless steel ones. Whether it’s for your own comfort, or the comfort of your clients, it’s a nice idea. Just a simple ceramic blade, and that’s nothing else than Andis’ coarse ceramic cutter. A budget-friendly, quite potent blade. I want to emphasize on this: installing a ceramic blade on your Fast Feeds will require some skill and effort. In addition, there might be some side effects like the clippers being louder. This is due to the ceramic blade being just a little bit wider than the Fast Feed steel one. This means it won’t be perfectly centered on the hair clipper. Here’s the perfect video you should watch before trying anything out. It’s not that hard, but I just don’t want you to mess up your clipper! I am a writer at HCC. Can wahl guarfs fit the fast feeds? Sorry for the late reply — but no, Wahl guards don’t really fit the Fast Feeds properly. Mainly Andis Nanos or the Oster stock guards, but I really recommend the first option. I bought fast for my beard only. Do I need to zero gap and ceramic blade. I keep my beard medium length. No need to go to such lengths if you’re looking for beard trimming. The zero gap/ceramic blade is more for those who want extra close-cutting action. For example some fading/blending, or even bald fades. I’d say for a beard of any length, especially medium, you can use the stock blade comfortably. If I zero gap them, will they still cut a #000 to #1? if they give a shorter cut with the lever closed, does that mean the lever open is not going to be cutting at #1? Great post, thanks. Any advice on replacement taper blades for the Oster? Seems like the Nano doesn’t offer a taper. I got the speed lines which is exactly the same as fast feed and also got the ceramic blade. My only issue is that the ceramic blade is wide and that causes the blade to hit the purple magnetic guards. Does that happen with the double magnet guards? Yes, they work very well on the Oster Topaz! will the double magnetic gaurds ever be in stock again? Every website I go to seems to be out of stock or they are way too expensive? Hi Angel. Sorry you’ve been having trouble with that. When I checked, the small set of guards was out of stock, but the larger set was selling for just over $20. It may be that you just have to check back occasionally to see when they are in stock. They could be waiting for a new shipment. You’re right that there were a few selling on eBay for outrageous prices, but I found the large ones at Barber Depot as well at very reasonable rates. I’ve reached out to a few places, they expecting shipments around June 9th. Seems like the demand for them are insane, so it wouldn’t be a bad idea to preorder them from a trusted source. I been searching local beauty supplies and all, only end up finding the large ones. Good luck with search. Thanks for the tip, Eric. No these ones are not the same. These will only fit on smaller hair clipper like the Fast Feed anyway. Great website…. Question: How do I get a 5/32 on a fast feed? Thanks! Hi Chris. You should look at the 1.5 guard for the Fast Feed. That will leave it 4 mm which is the same as 5/32 inch. Man, when will we finally switch to metric? It’s so much easier lol! I have been looking everywhere for the 1.5 guard but have found nothing for the fast feed. Do you have a model # or link? Thanks! We’re a group of enthusiasts here to help you pick the right clippers and understand how they work. You can count on us for thorough and honest comparisons, reviews and guides. Enjoy your stay in the Hair Clippers club – we’re thrilled to have you with us.